The release of the President’s budget request signals the official kick-off of the annual appropriations process in Congress. However, before Congress can fully dive into the FY 2020 bills, lawmakers must address a larger threat facing federal funding for next year. As COSSA has been reporting, discretionary spending that is appropriated every year by Congress has been subject to austere caps that were put in place in 2011 as part of a larger effort to significantly reduce the size of the federal budget over 10 years. The Budget Control Act of 2011, or BCA, put in place caps on discretionary spending for both nondefense and defense spending for the period of 2013 through 2021. Thankfully, since 2013, Congress has been able to find bipartisan ways to amend the BCA and provide relief to the caps, allowing federal R&D agencies (as well as other parts of the federal budget) to achieve funding increases above the caps each year. However, the latest relief measures only raised the caps for fiscal years 2018 and 2019, meaning that unless Congress acts to address the caps again for FY 2020, they will take effect once again, resulting in a cut of $54 billion (9 percent) from nondefense discretionary (NDD) spending (which includes most research accounts), and $71 billion (11 percent) from defense discretionary accounts. In future years, under the President’s proposal, NDD funding would be reduced by an additional 2 percent each year through 2029, while shifting funding to “resource national defense requirements.” Interestingly, the President’s request itself violates the BCA by proposing to bust the defense discretionary caps by $165 billion (using the controversial Overseas Contingency Operations (OCO) account to further pad defense budgets). Therefore, regardless of where you stand, a deal will need to be struck in some form in the coming months if either side—defense or nondefense—are to see desired increases. 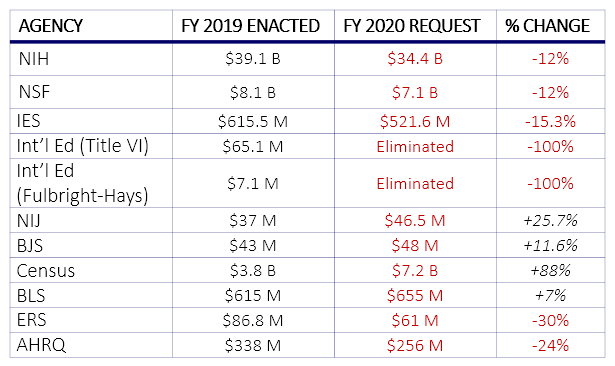 Lawmakers have already started talks and will be working for the next several months to attempt to strike a deal to prevent these cuts from taking effect in FY 2020. Of course, given the hyper-partisan and contentious nature of today’s Washington, a bipartisan deal is not guaranteed. You can expect to see the funding debate heat up in the coming weeks and perhaps also stretch into the fall or beyond. COSSA has issued an action alert urging members to write to their Members of Congress to tell them to prioritize a budget deal that gives fair treatment to vital non-defense discretionary (NDD) programs—including science and research agencies—which have disproportionately borne the brunt of federal spending cuts over the past several years.